Views, folders, dashboards, and visual reports in Targetprocess can be Public, Private, and Custom shared. These settings control whether they appear in the views list (left navigation menu) for everyone or for selected people only. This article describes how to manage visibility and access settings for views, folders, dashboards, and visual reports. Anyone can create Private and Custom sharing views. Only Administrators can create Public views and folders. Only Administrators and Owners can change or delete the Public views and folders. Public View is visible to anyone. If you don't want to see a public view in the left menu, you can shove it into the hidden (More) section, but you can't remove it completely from the menu. Private View is visible to a view owner only. However, it is accessible via direct link for administrators as well. Custom sharing View is visible to all members in selected Teams and Projects or to specific users. These settings are applied to users having active Targetprocess account. Access settings for external users are managed separately. More information: Share View with external users. Views that are put into a folder always inherit access permissions from the folder. Starting from version 3.9.1 you can now share views and folders with specific individual users. This means that you'll no longer have to create a team in order to make views visible for specific people. Just select 'Custom sharing' in a view's Access tab and choose users who will have access to your view/folder. It is possible to share your Views with people who don't have Targetprocess login. When you have an on-demand account with Targetprocess, you already have a special add-on named Share View mashup pre-installed and activated. This feature allows you to share your Views (any mode except One-by-One) with people who don't have a Targetprocess login. A link to a Shared view with your data is provided by our tauboard.com web server and can be accessible by any user who knows the exact direct link without any password prompt. A view can have several co-owners, or "many owners". Any view co-owner has the same privileges as the original view owner. Owners, co-owners and Administrators can change the view settings. So if you're sharing your view you should not worry about others messing around with its settings. Changing majority of users to non-administrators and explicitly setting some people in charge as owners is a common recommended practice. A view owner can't remove herself. A view must have at least one owner. When a view is part of a folder, then it inherits origin list of owners from the folder. 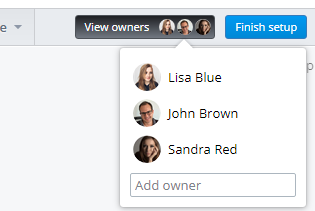 Additional co-owners can be added/removed to the particular view. All views in a folder always have the same access permissions. If you change the permissions of a folder it is automatically applied to any Boards, Lists, Timelines, Reports and Dashboards that are part of this folder. As a result, when a view is part of a folder you cannot change the access permissions of a specific view, this is always inherited from the folder. Public views cannot be included into private and custom shared folders. Custom shared views cannot be included into private folders. More information: How to manage views and put them in a structure.